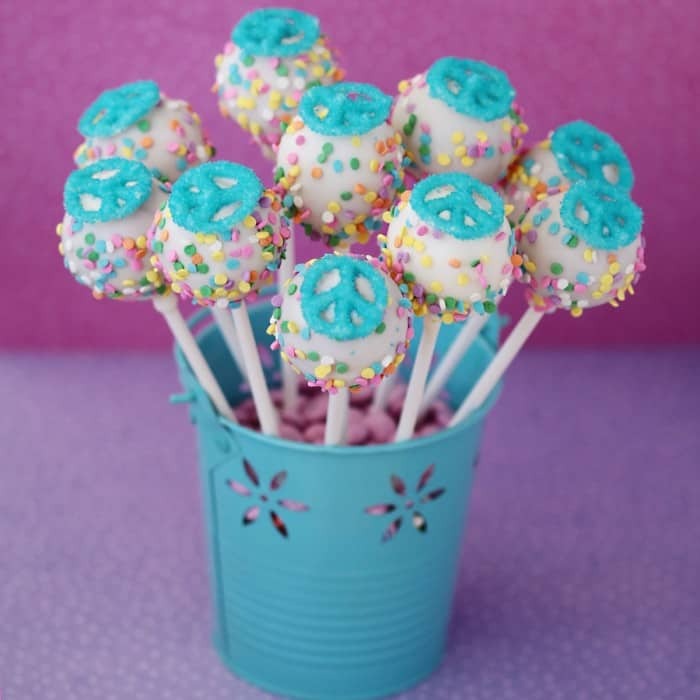 Peace, Love & Cake Pops…. While I generally do not sell my sweets and treats, I do take special requests from friends and family. 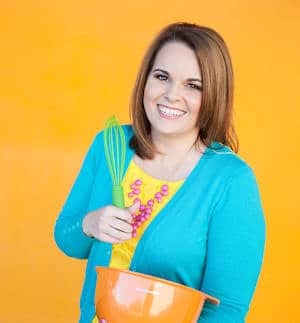 Last week one of my fellow dance moms (yes, I’m a dance mom – though I like to think not quite like these dance moms) asked me if I could make cake pops for her wonderful daughter’s 13th birthday. She’s a great girl who has always been super sweet to my daughter, so I was more than happy to make her a little something special for her birthday. Her mom told me that she liked peace signs and the color blue, so that’s what I was working with. Luck have it I found a perfectly sized box decorated with peace signs at Hobby Lobby to use as a display, as well as a cute peace sign ornament (one plus of a full Christmas display in September), which made it even more fun. I love to pick up ornaments that can be used on gifts or packaging in a totally non-Christmas way. 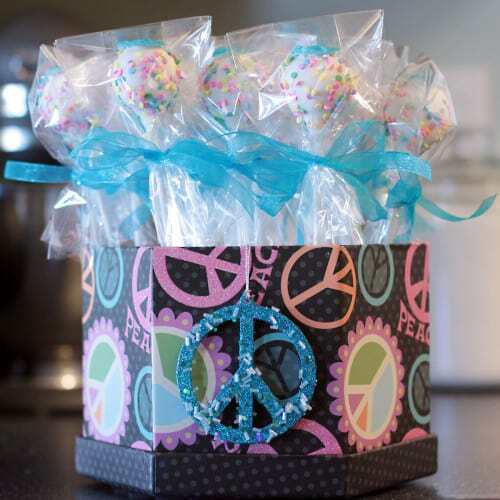 I looked around online for some ideas and stumbled across these darling Peace Sign Cake Pops at The Blackberry Vine. When I saw she even had a free peace sign printable for making the chocolate peace signs, I knew I had found my inspiration and was ready to make some chocolate peace signs. This was the first time that I piped chocolate to make any sort of decoration, and it was pretty simple and straight forward. 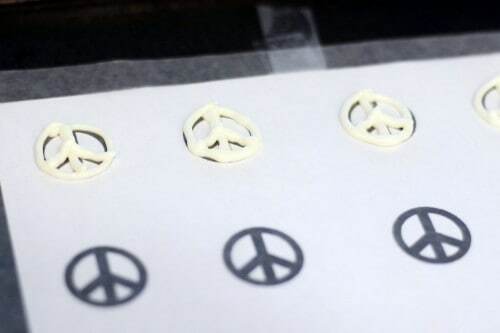 The printable, under the wax paper, made it easy to keep my peace signs consistent in shape and size. 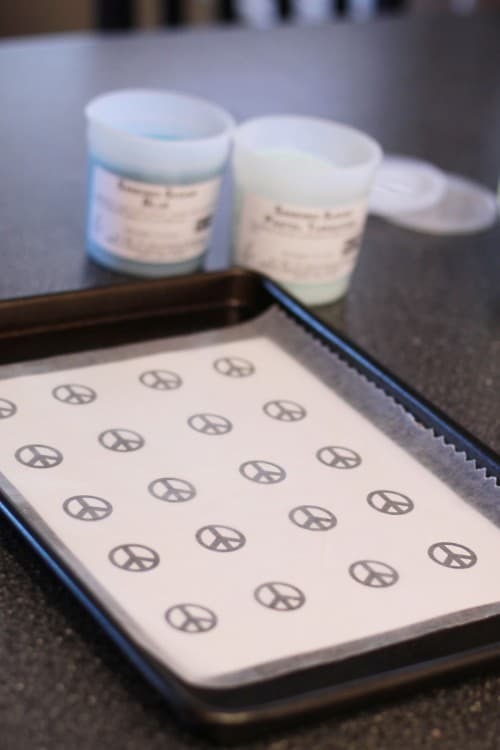 I taped the peace sign template and wax paper to a cookie sheet to keep them from moving. 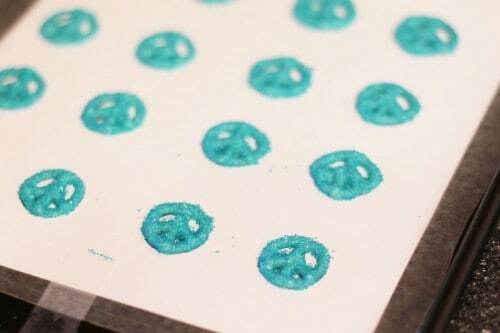 I would pipe a few and then cover with sugar sprinkles, pipe a few more, and so on, until the entire sheet was covered in pretty turquoise blue sugar. I let them set up then poured the loose sugar off and was left with cute little chocolate peace signs. 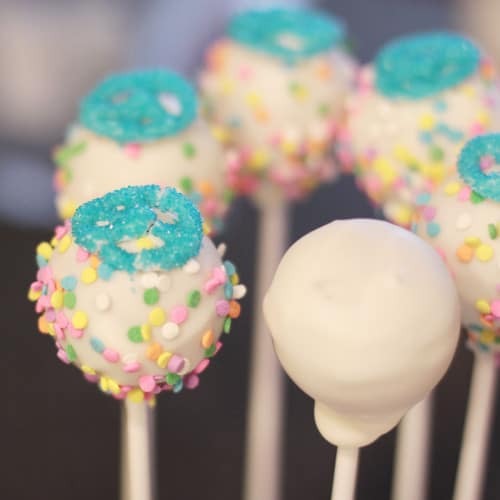 I made my cake pops using the vanilla cake pop recipe from the cookbook that comes with the Babycakes Cake Pop Maker (which I love with a passion). If you would like to see step by step how I make my cake pops with the Babycakes Cake Pop Maker, check out this post. 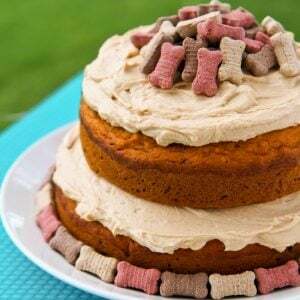 For how I make the “classic” Bakerella style cake and frosting cake pops check out this post, or for the Oreo truffle pops check out this post. The Babycakes Cake Pop Maker is great because you can whip out a ton of cake pops quickly (I also prefer the taste/texture to the frosting and cake variety). 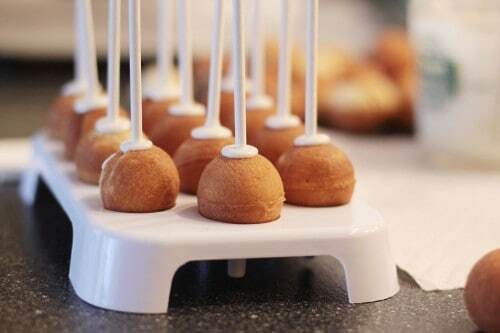 I always dip my sticks into chocolate, and then into the cake pops and let them set up and chill in the freezer before dipping the cake pops into chocolate. This helps with the cake pop jumping off the stick for a swim in the chocolate scenario. From there it’s a matter of dipping them into chocolate (I only take a few out of the freezer at a time so they remain cold), adding sprinkles and setting the peace signs on top. I finished the cake pops off with cellophane bags (which can now be purchased online from Babycakes) and some ribbon, cut styrofoam to fit the box and added the cake pops. These were really fun to create and I hope the birthday girl enjoyed them! Peace out. (Sorry, I couldn’t resist). These Pop are absolute CUTE. Good to know you actually prefer the taste of the Babycakes cake pops, too. I am *this close* to buying one of their cakepop makers. You have awesome ideas . And your site give me lot ideas to make my own things life you . These are super cute…. 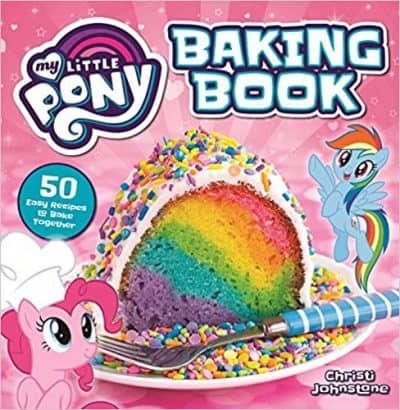 I’m totally on the fence with buying the cake pop maker. I want one but do I NEED one lol. Your pops are too cute. I try to avoid gadgets with cords but I’m feeling like I may need to buy one of these cake pop makers. I hate to make cake balls because I have to form them with my hands. I’d love to eliminate that step. These look so cute. I love the idea of the stencil. They came out great. The box was perfect. The whole package is beautiful. These are too cute!! Love them. Fantastic cake pops. I love the peace sign. 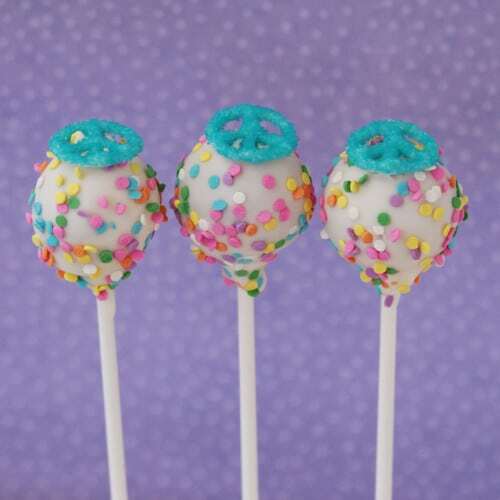 I’ve never made cake pops but would really like to try them. 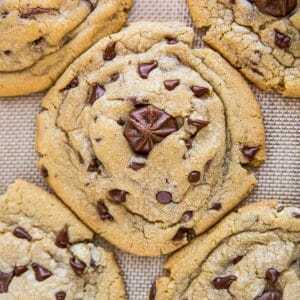 Wooowowo , these look so cute and the step-by -step instructions are really great . These cake pops are much better than the Cake pops with frosting which are just too sweet , but once more really BEAUTIFUL cake pops . These are just so cute. Even your “not” perfect ones still look pretty good. 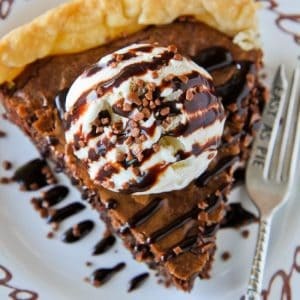 I still struggle getting the sprinkles on the warm chocolate without all dripping everywhere. Very cool! Love it. 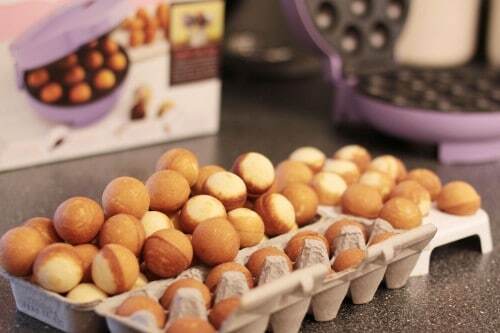 I think I want that babycakes cake pop maker. 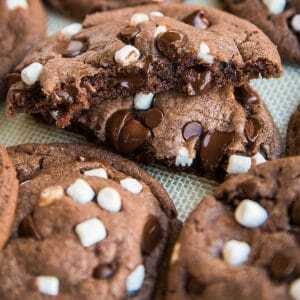 I have heard mixed reviews but yours look like they turn out great. Think I will give it a try. 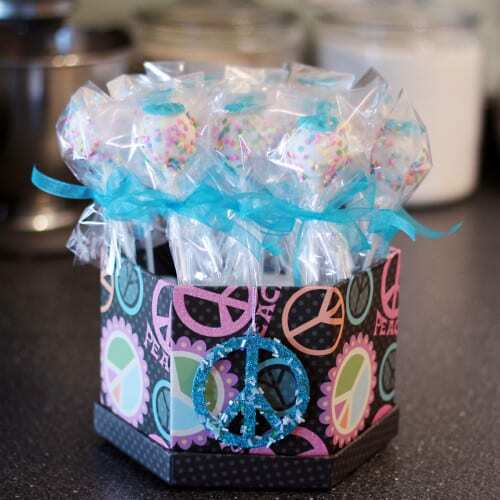 My kids love cake pops and we have lots of birthdays and bake sales coming up!! These are beyond cute! 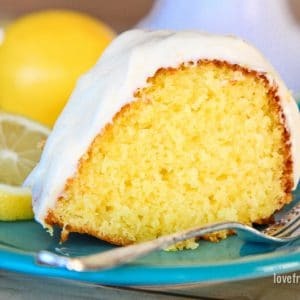 Looks like that baby cakes maker is being put to use! Might have to check one out! Cake pops make for such a wonderful presentation! Also making them looks like a lot of fun for an afternoon. You did an awesome job on these-great post. Donna it’s a Babycake Cake Pop Maker, made by Select Brands. You rock! These cake pops are too cute! I love the blue peace signs. I love these and Im also a dance mom and deff not like the dance moms on the show! i watched the last episode last night and was so happy for little Clhoe to get the lead in the video! (went off topic) but i couldnt resist commenting on the dance mom comment! 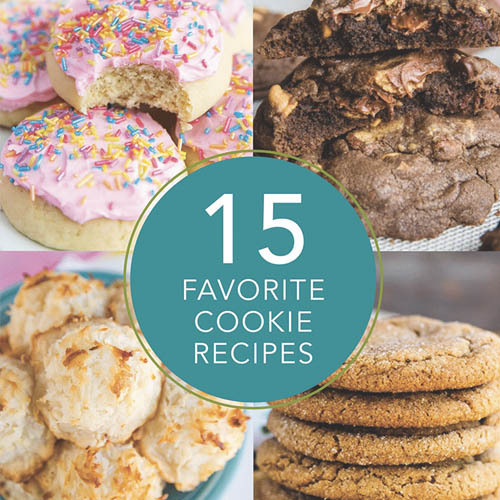 thanks again for all of your great recipes and ideas! haha!yay! now if i can only get these candy melts to melt the right way! i have tried everything and they melt so thick there is no way i can dip any pops in there 🙁 very frustrated! I dont understand what I’m doing wrong! 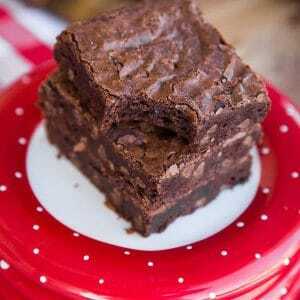 it melts, just the consistency is very thick and not like in the pictures. its just too thick to use for dipping. ive tried everything i can think of! any suggestions from anyone would be greatly appreciated it. 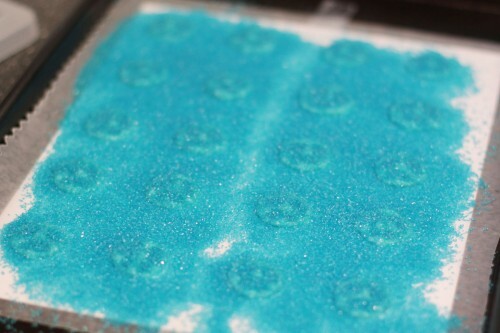 I am using wilton candy melts and following instructions with microwave melting method. I have a friend who’s daughter would love these, may have to give it a whirl! You have done some simple, yet complex work, and they look amazing!! really cute looks… real yummy. How big are they before you dipped them with chocolate. try to compare sizes of different cake pop makers. Eould like to know how lOng can this cake pops last before it get spoiled or rotten? How long can it last by using the baby cake pops maker as not much sweet is using?